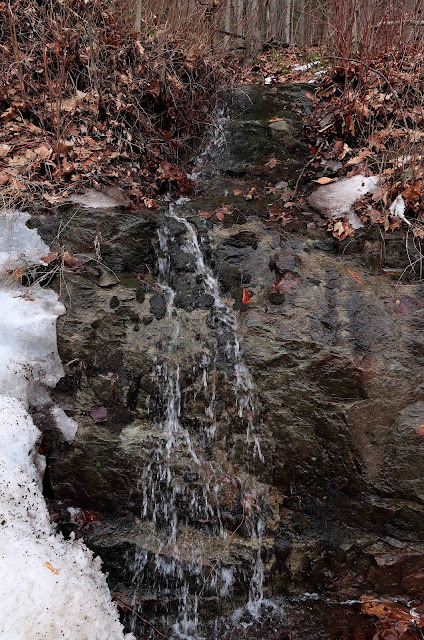 Thanks to a whole string of above-freezing days this past week, it feels as if winter is losing its grip and spring is on the way. 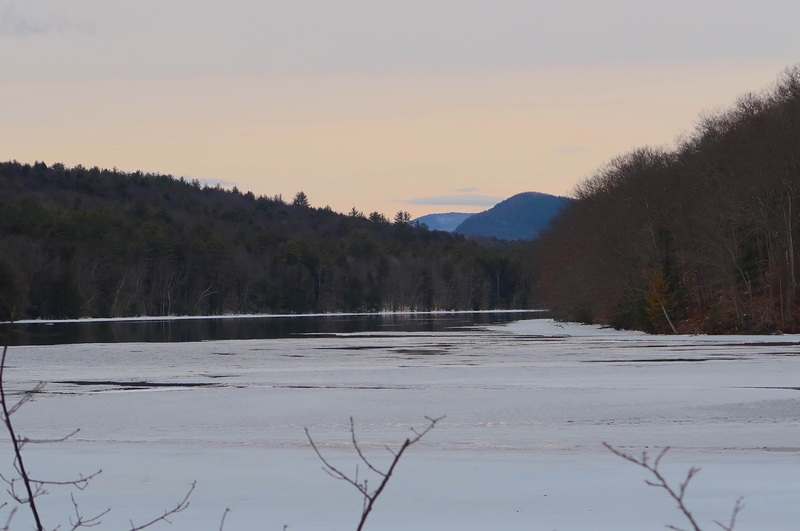 When I walked along the Hudson River above the Spier Falls Dam last Sunday, I was pleased to see that the ice was breaking up even in the long-frozen bays. Then, as I walked along Spier Falls Road where the mountains rise sharply from the road's edge, the music of splashing water greeted me from tumbling creeks and many tiny spring-fed rills. 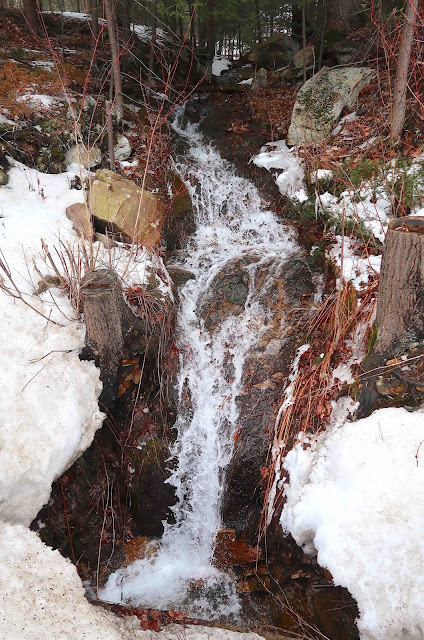 Just across from the dam, where a creek comes bounding and crashing down the mountainside, the lower part of the waterfall was still encased in ice. But higher up, where the sunshine has had more opportunity to warm the rocks, the water was freely flowing over moss-covered boulders. Many people think of the shrill calls of Spring Peeper frogs as the first music of spring, but the sounds of splashing water, dancing as if in celebration of its liberation from enprisoning ice, sure sings of springtime to me. 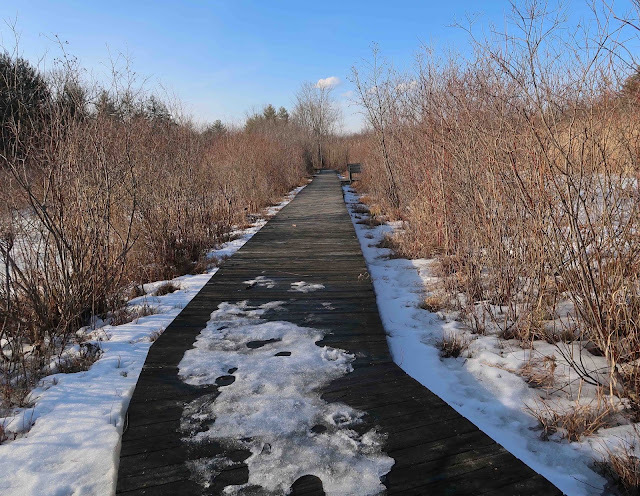 Today, Tuesday, the air was warm and the sun brightly shining, tempting me out to take a walk along Bog Meadow Brook Trail near Saratoga. 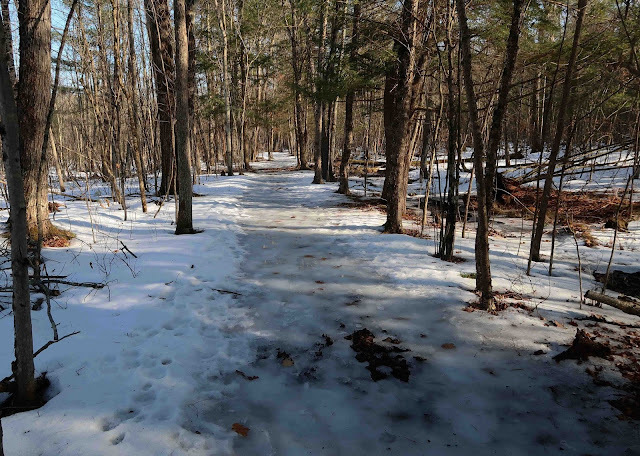 Although most of our roadsides and open fields are now bare of snow, the woods are still deep with it, and the well-trodden trails remain quite icy. 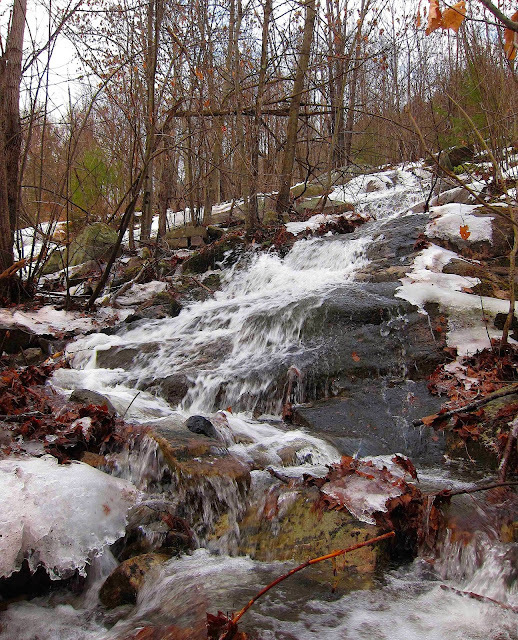 Ice grippers on my boots, I set off along the trail that leads through wooded wetlands. I had searched several muddy swales this week, finding the Skunk Cabbage shoots still tightly swathed by the pale-green bracts that had protected the undeveloped spathes all winter. 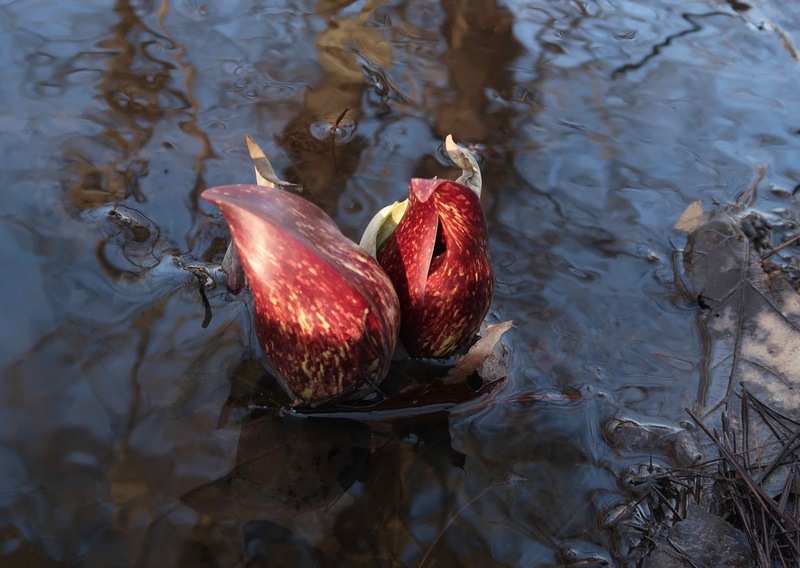 But here in the tiny brook that runs by the Bog Meadow trail, some spathes had swollen to burst free of those enveloping bracts and had already turned their gorgeous Morocco-leather red. Some of the spathes had opened a little, so I could peer inside to see the developing spadices, which were still smooth and bald and not yet producing pollen. So I can't yet call these the first flowers to bloom in spring. But it won't be long before I can! 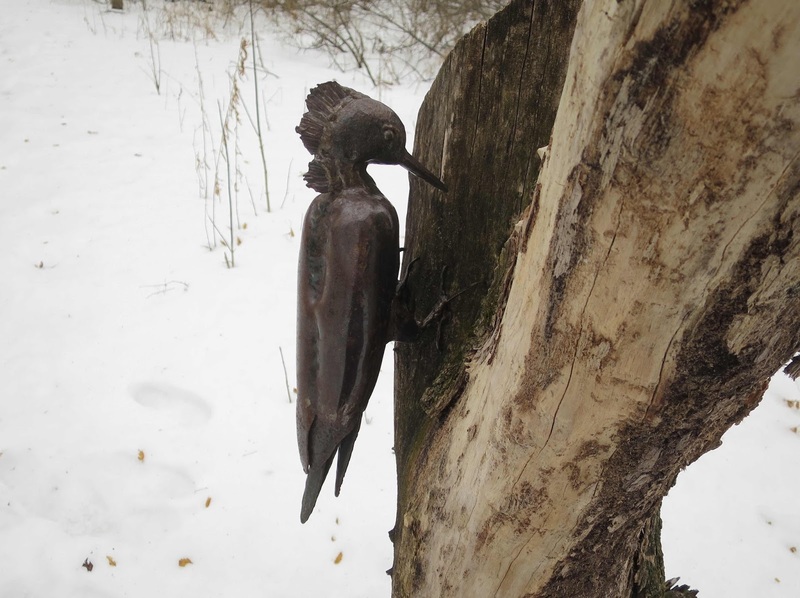 I continued along the trail to where it leads to a boardwalk over an open marsh, the boardwalk lined with willows and alders and red-twigged dogwoods. I could see the willow catkins were just beginning to emerge from their buds, the "pussies" almost ready to fluff out their silken "fur." A sure sign of spring! 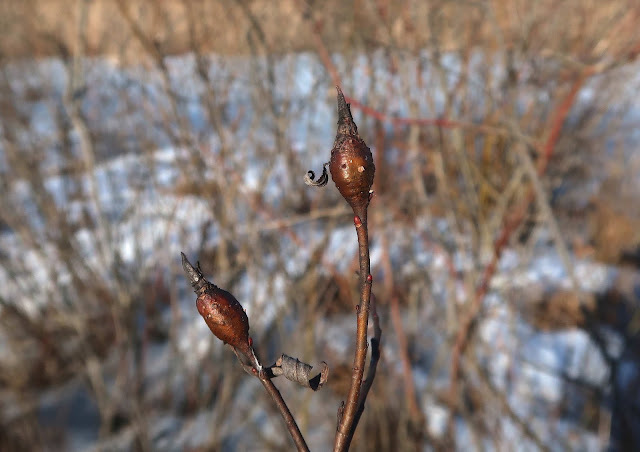 I noticed that almost all of the willows were sporting at least one of two kinds of galls. The Shoot-tip Rose Gall looks like a dried flower at the tip of each branch, and is caused by a tiny fly (Rhabdophaga rosaria) laying its egg in a slit in the branch. The tree then produces this flower-shaped rosette of tissue surrounding the egg, to protect the larva as it matures. Other small willows were bearing multiple hard, brown, spindle-shaped swellings on their twigs, each one with a bud protruding out of the top of the gall. These Willow Beaked Galls are caused by another tiny fly called Mayetiola rigidae. 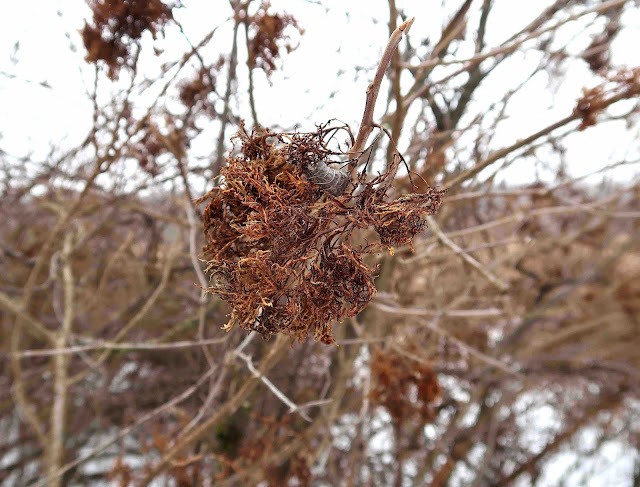 The larva is wintering over within the gall and will emerge in the spring. 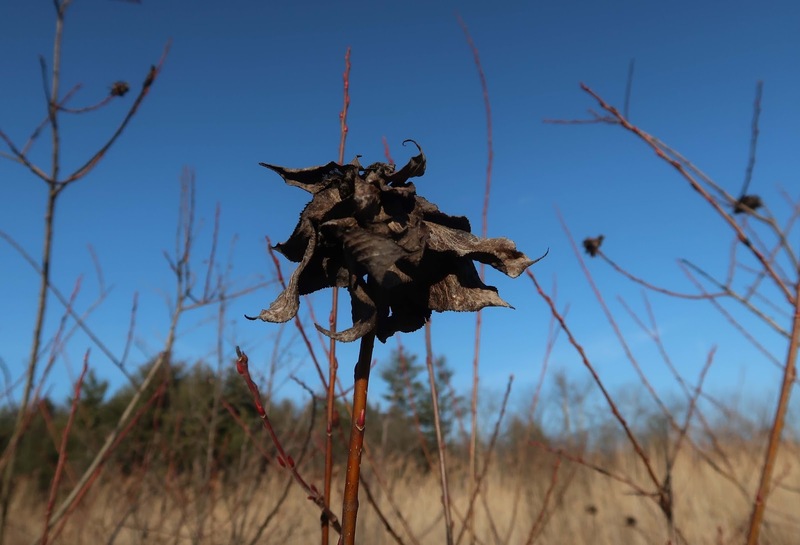 Willows play host to more kinds of galls than any other woody plant, and now is the best time to find them, since once spring comes, they will be hidden among the leaves. Freakishly warm today! 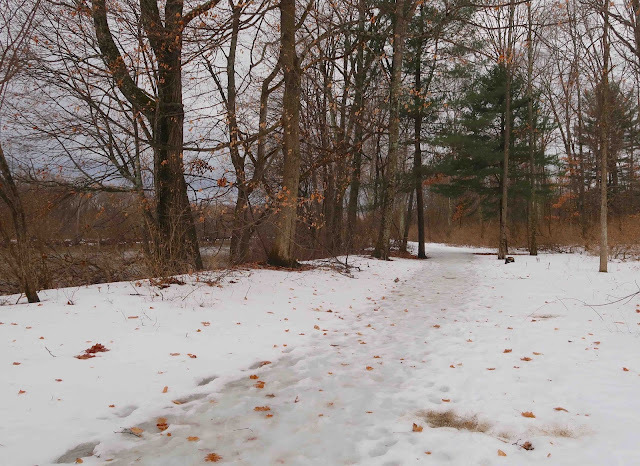 The temperature was in the low 70s, but it was still quite icy underfoot where I walked along the Hudson Crossing Trail at Schuylerville. 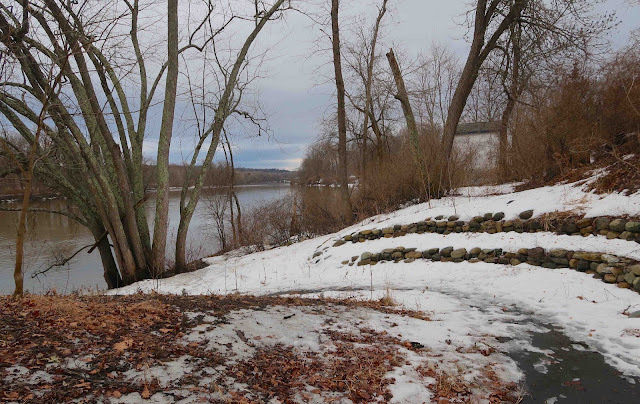 With snow melting fast on this strangely warm day, I feared that the Hudson River might be flooding, but no, the water, while muddy and roilng, remained well within its banks. Although the day was dark and gray, it was pleasant to sit by the river and enjoy the balmy air and the sound of the rushing water. 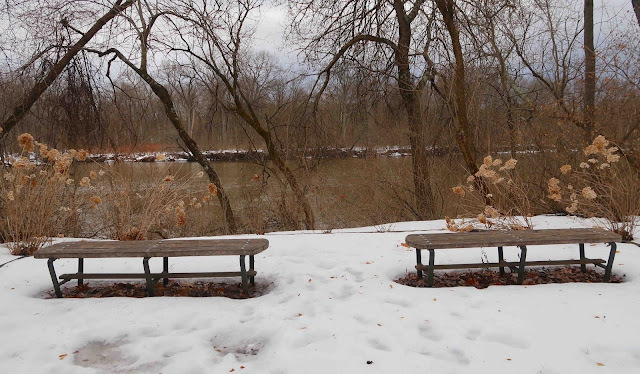 The designers of this trail have added many places to do just that, with benches placed at intervals along the way. 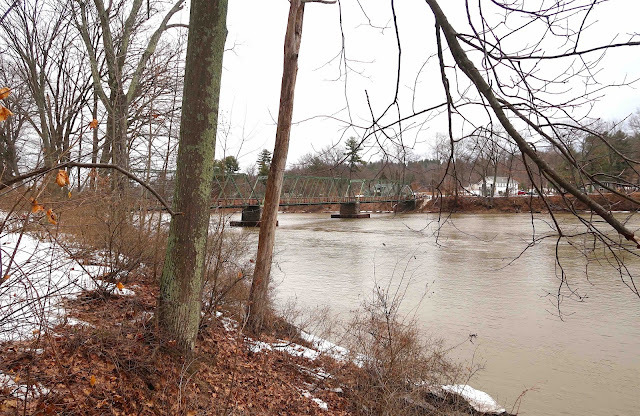 It will be many more weeks before I think about paddling the river, but it's good to know there are sites along this trail that would make it easy to launch my canoe. 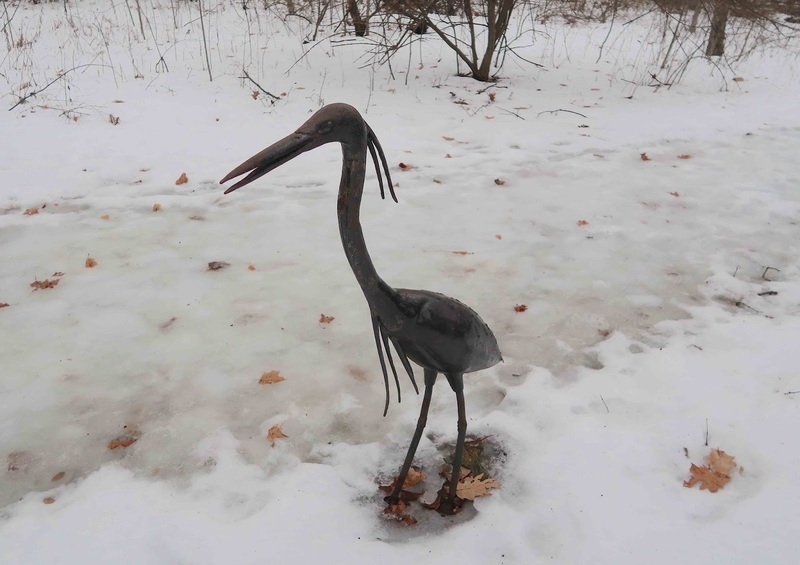 My birding friends report seeing Bald Eagles and all kinds of migrating waterfowl along this stretch of the Hudson, but the only birds I saw today were made of metal, like these life-sized iron sculptures, a Great Blue Heron standing by the trail and a Pileated Woodpecker mounted on a tree stump. 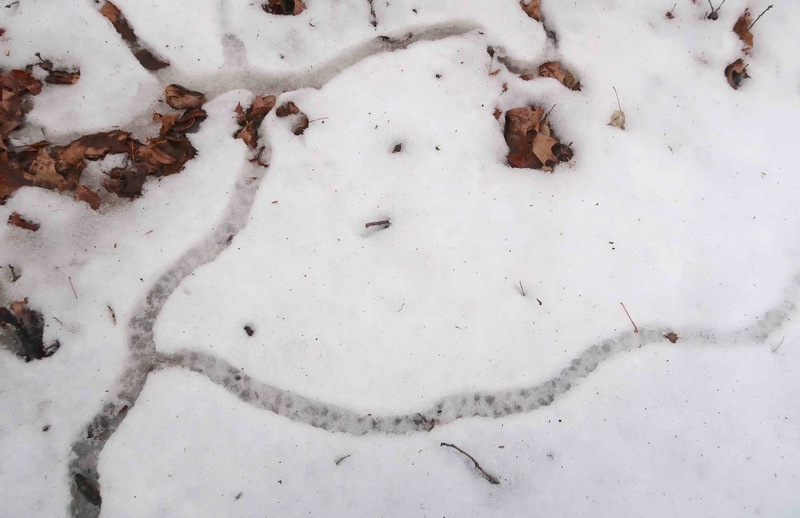 I did not see the mouse or vole that made these subnivean tunnels, but the little creature's active travels beneath the snow have become quite evident, now that the snow has melted and uncovered the branching paths. 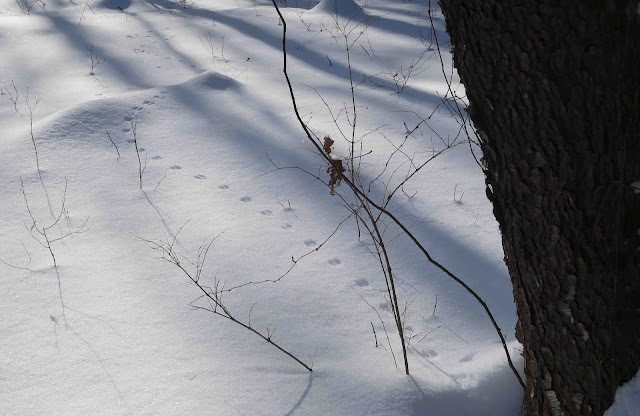 By tunneling under the snow this way, these little rodents can stay warm and safe, invisible to such predators as owls and foxes. 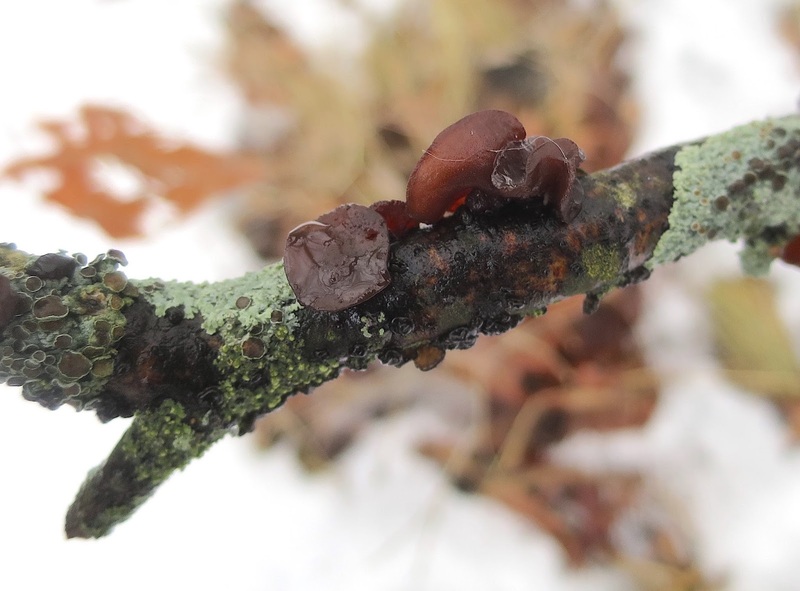 Winter's snow and ice bring down many tree limbs over the course of the season, and this limb was particularly colorful, adorned as it was with a pretty green lichen and the dark-brown rubbery "ears" of Wood Ear Fungus. 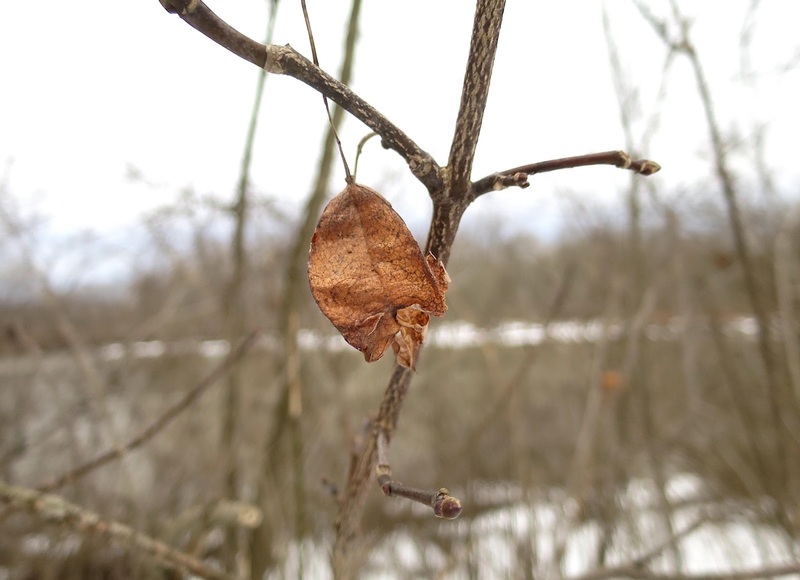 There are many American Bladdernut shrubs along these river banks, and some of them still held a few of the hollow pods that this shrub is named for. Hackberry trees are also abundant here, and they are immediately identifiable by their distinctive, deeply ridged bark. 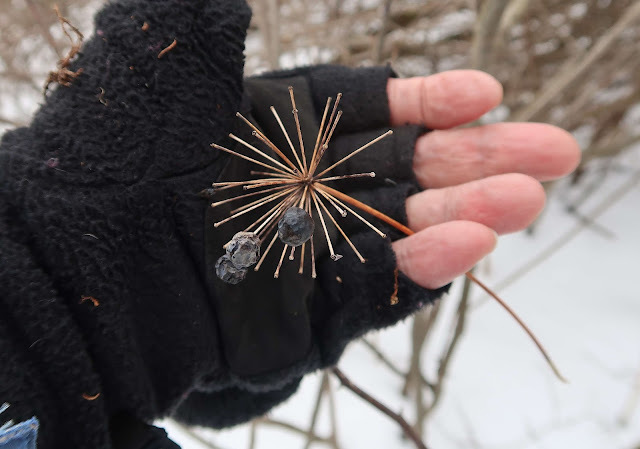 Tulip Trees are NOT abundant this far north in New York, but I know exactly where to find one small sapling that grows at an intersection along this trail. 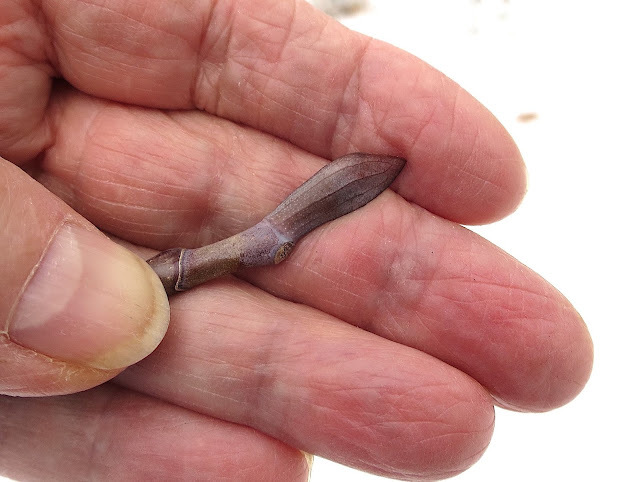 Normally, these giant trees are way too tall for me to reach their buds, but because this sapling is still small, I could really examine them. 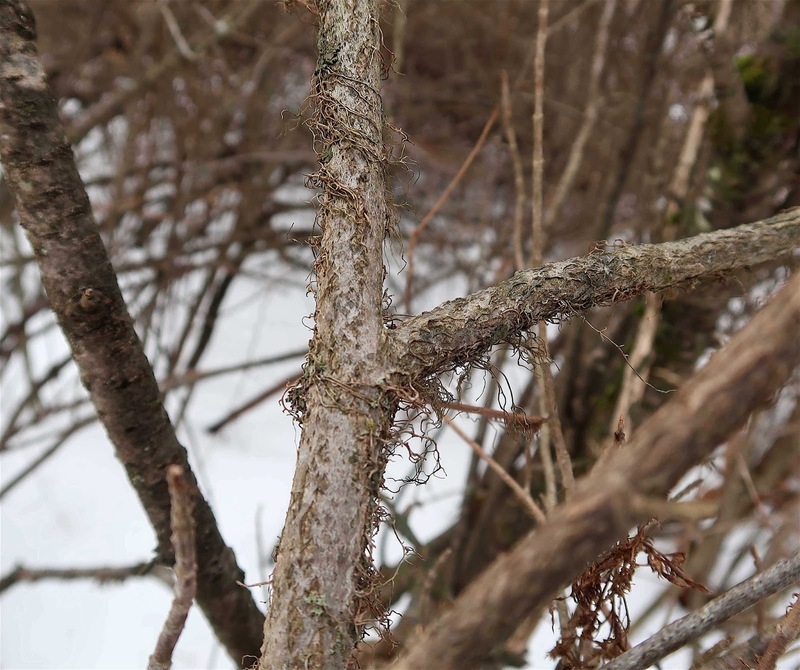 The purplish twigs were covered with a slight whitish bloom, and the terminal buds were flattened and leathery, quite unlike any other tree buds I have seen. Driving home through the rural farm fields, I enjoyed sweeping views of distant mountains and low clouds. I was amazed to see how bare of snow these fields had become, almost overnight. 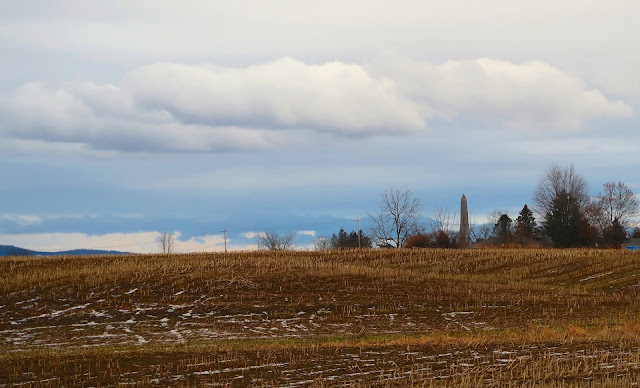 The obelisk of the Saratoga Battle Monument rises in the distance, beyond these rolling cornfields and wooded copses. Imagine stepping out your back door to enter your very own nature preserve! 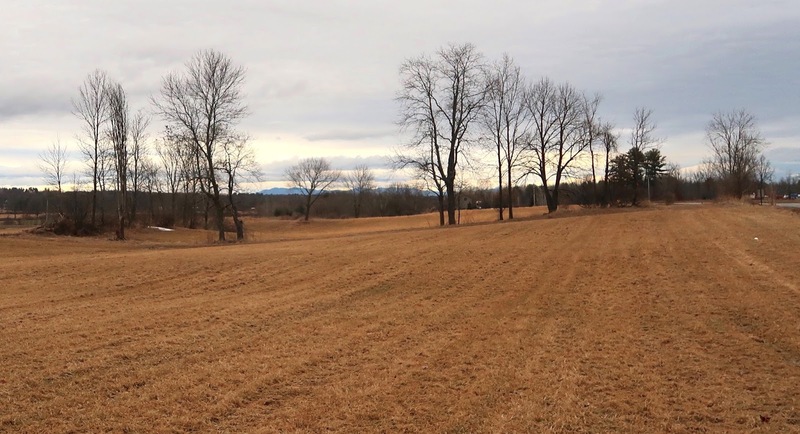 That's the case for my friend Nancy Slack, whose Schenectady County "backyard" consists of several hundred acres of forest and wetlands. This week, Nancy invited all of us in the Thursday Naturalists to come enjoy a snowshoe hike through her backyard preserve, our going made easy along snow-covered trails that were already nicely packed. We first realized our trails were passing through wetlands when we encountered extensive patches of Sensitive Fern, their green fronds long gone but their location marked by abundant spore stalks poking stiffly out of the snow. 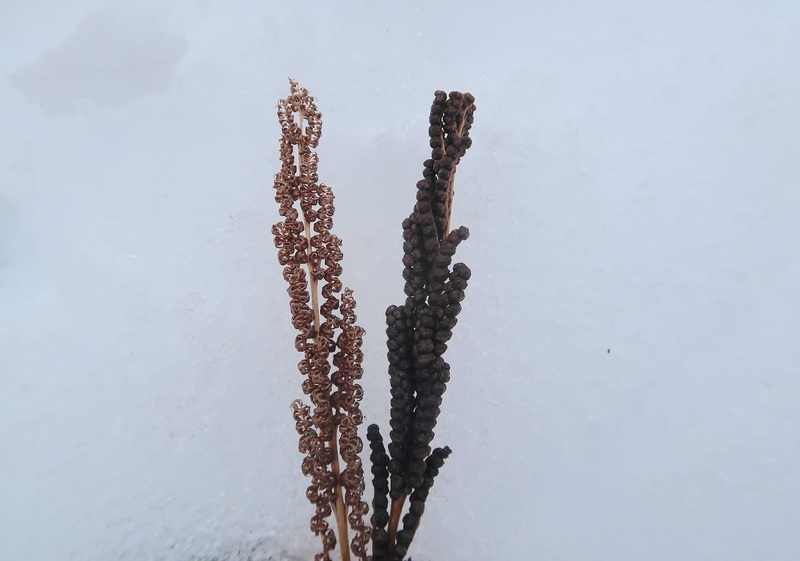 I was puzzled at first by some of the stalks that appeared more open and lacy, compared to the typical stalks that are packed tightly with dark-brown "beads" containing the spores. 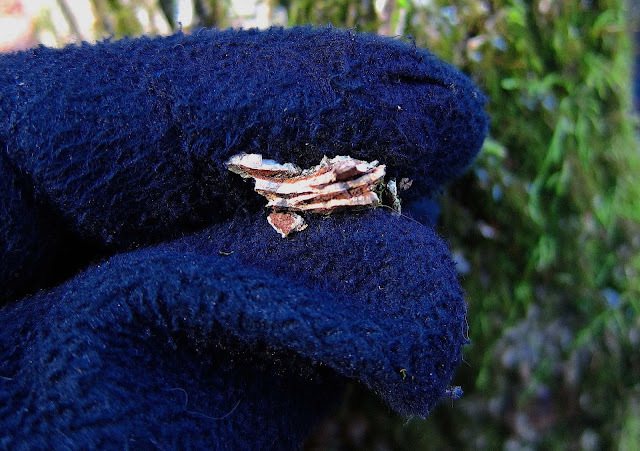 But one of our exceedingly knowledgeable companions, Ruth Schottman, explained that the lacier stalks were what remains after the spores had been shed. This was news to me! For many years I have passed by these spore stalks, and never had I noticed the stalks whose spores were gone! 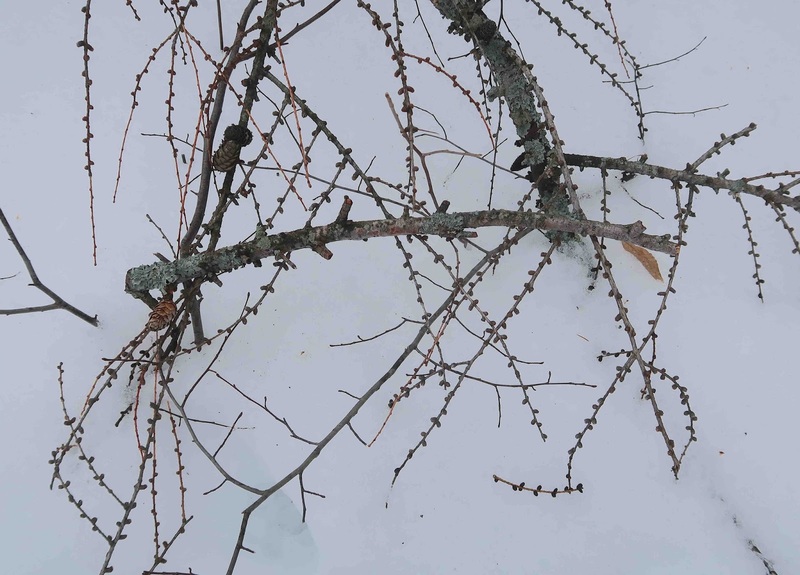 These twigs presented more evidence that we were passing through wetlands, for what other conifer beside the Larch has peg-like needle buds like these? And Larches like it wet. 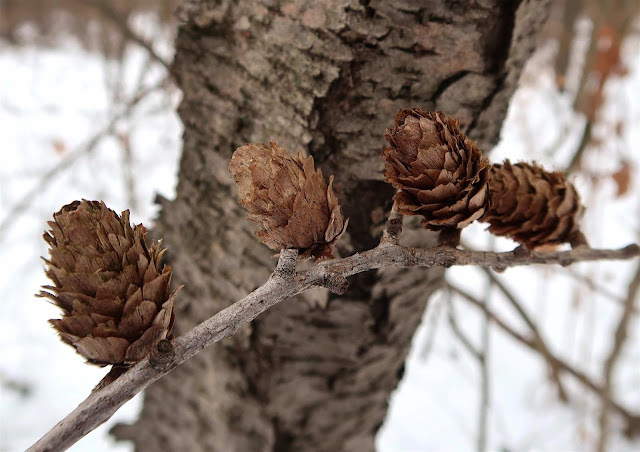 But here was another puzzle: these cones were way too large to be those of the American Larch (Larix laricina). That's when I learned that there are two introduced species of Larch that occasionally can be found in our wetlands, one originally from Europe (L. decidua) and the other one from Japan (L. kaempferi). I'm not sure which one this is. Both introduced species have cones that are larger than those of our native species. 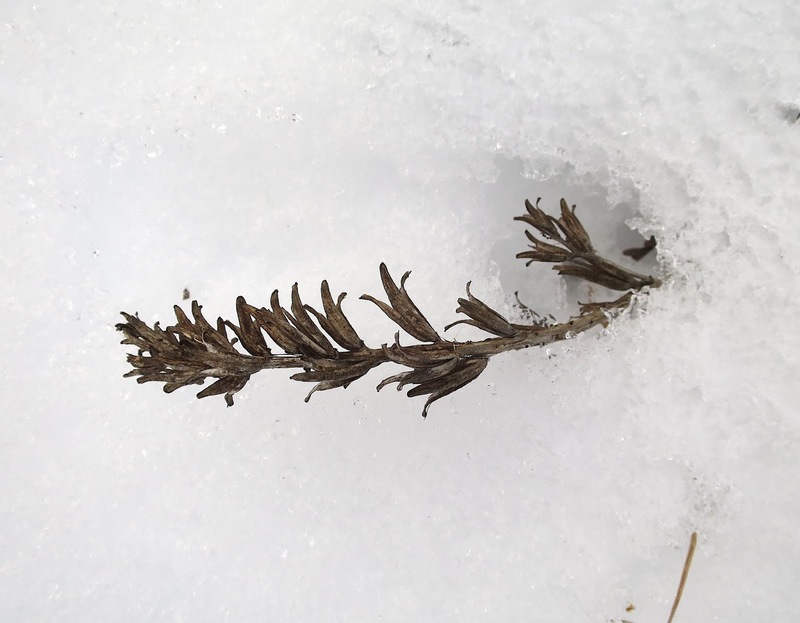 It's always fun to come upon plants that we would immediately recognize in summer, but which present puzzling ID challenges to us when we encounter their remains in winter. At first, I thought these spiky clusters were what was left of the fruits of Bristly Sarsaparilla. But I was wrong. 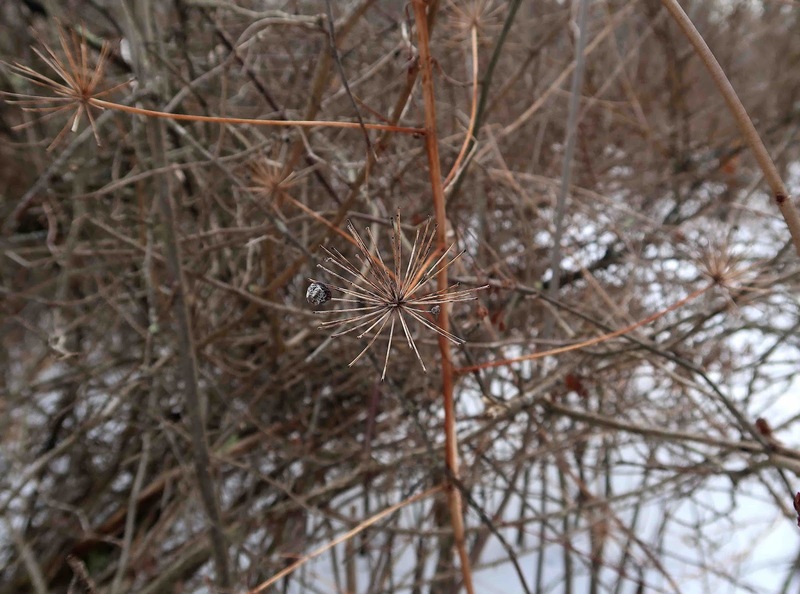 There was nothing bristly about this plant. Hmmm . . . . What else could this be? 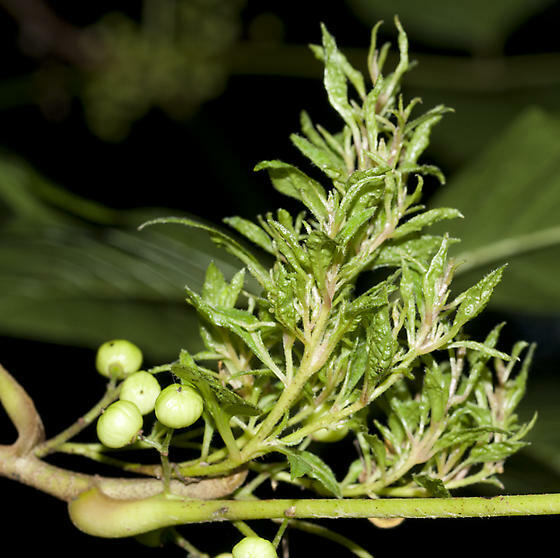 Nancy was the one who first suggested Carrion Flower (Smilax herbacea), and then it clicked: of course! What other vining plant produces such perfectly spherical umbels of dark blue fruits? 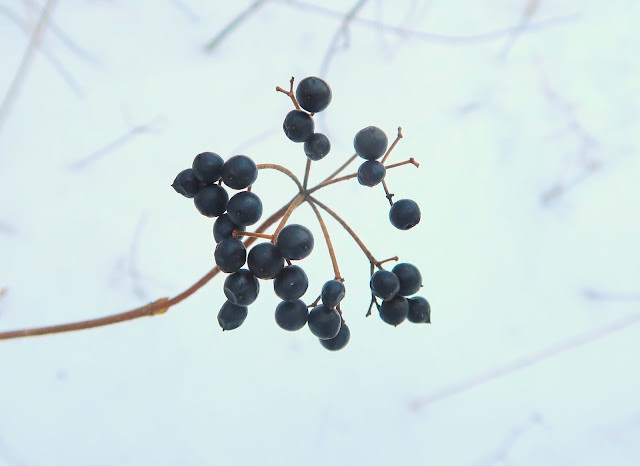 Here were some other clusters of dark-blue fruits, but these were not held in spherical umbels like those of the Carrion Flower, and they were growing on a woody shrub instead of a herbaceous vine. What else could these be but the fruits of Maple Leaf Viburnum (Viburnum acerifolia)? Our major puzzle of the day was this vine containing multiple clusters of tiny ruddy-brown dried leaves. Laurie and Ruth are here taking a closer look, acknowledging that neither of them had ever encountered a plant that looked quite like this. Neither had I. Here's a closer look at one of the leafy clusters. 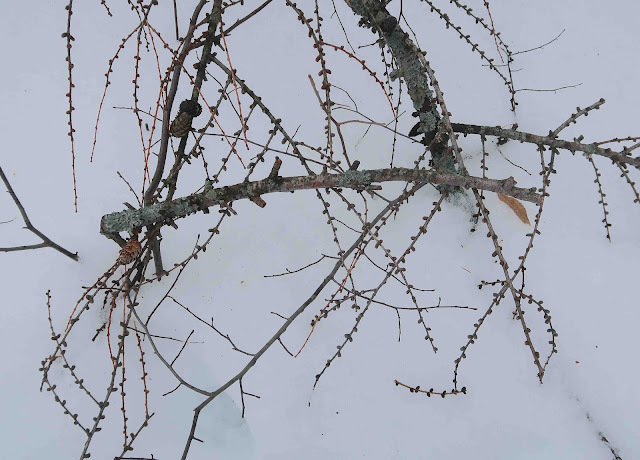 I suggested it could be some kind of "witches' broom" -- a plant deformity caused by a pathogen that produces a great proliferation of leafy shoots -- and both Laurie and Ruth agreed. But what species was the host plant? When I got home, I searched on my computer for "witches brooms on Poison Ivy" and discovered this photo posted by a man named Karl Hilliq. I hope he doesn't mind that I borrowed his photo to reveal what our dried-up clusters of leaves would have looked like when they were green. Finally, after several days of freezing rain that drenched and then ossified what had been a lovely base of fluffy snow, the sky cleared and the sun shone warm on what still LOOKED like a lovely landscape. 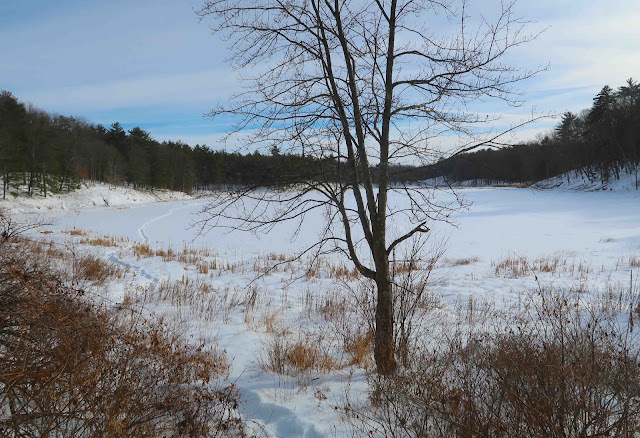 As I strapped on my snowshoes, I couldn't wait to start moving across the surface of Mud Pond at Moreau Lake State Park yesterday. With the pond still solidly frozen with thick ice, I hoped to explore some areas of shoreline that in warmer times are way too muddy to walk on, as well as being thick with skin-clawing plants that can slice bare shins to a bloody mess. My legs now armored with sturdy snowpants, I set off across the frozen expanse. But I didn't get far. That deep snow had been honeycombed by the rain, and then coated with a thick icy crust. 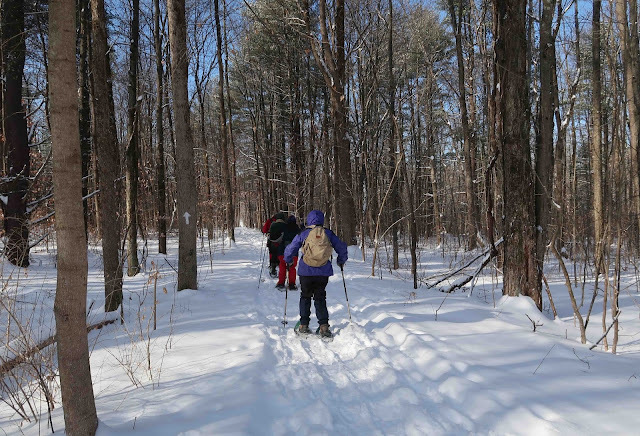 My snowshoes plunged deep down through the weakened snow, and the icy crust prevented me from pushing ahead. I had to lift my feet clear of each footprint to proceed. I soldiered on for about 50 yards, huffing and puffing from the effort, and then my sore knee hollered at me: NO MORE! So I headed back the way I had come, the effort a little easier, now that I'd already broken trail. Ah well, the excursion wasn't a total loss, since I managed to amuse myself by admiring the remains of last summer's plants, still possessing their own kind of beauty or interest. 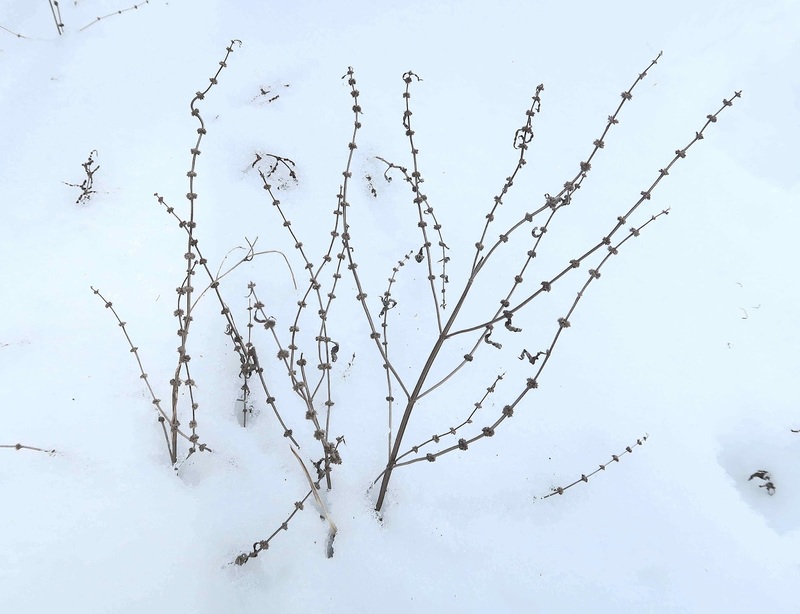 These dense tapering clusters are the remaining flower heads of Steeplebush (Spiraea tomentosa). 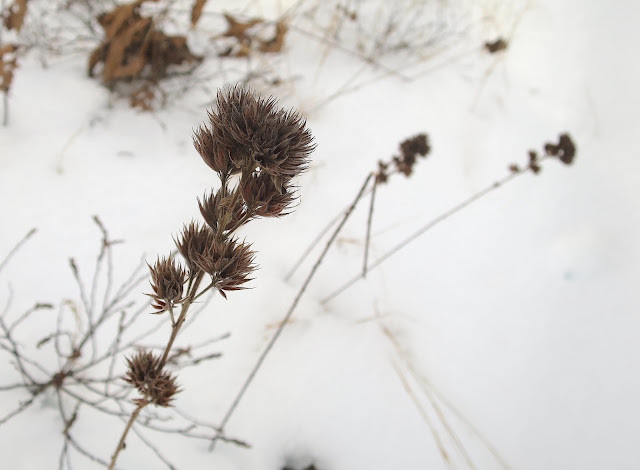 These spindly stalks rhythmically dotted with tufts of floral bracts could be either of two species of Lycopus, either L. uniflorus (Northern Bugleweed) or L. americanus (Water Horehound), two Mint-family plants that are difficult to tell apart even when in bloom and in possession of their leaves. 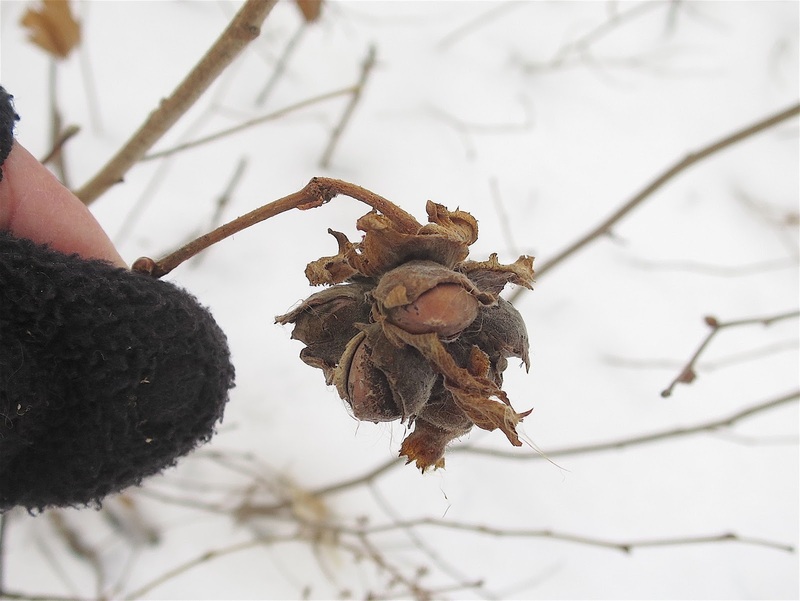 I was surprised to still find clusters of Hazelnuts (Corylus americana) dotting the shoreline shrubs, since these nuts are a favorite wildlife food. Perhaps they were wormy or moldy. Or maybe the squirrels are saving them for later? I think it's funny how wormy these Hazelnut catkins look, as if the shrubs were infested with crawling larvae. 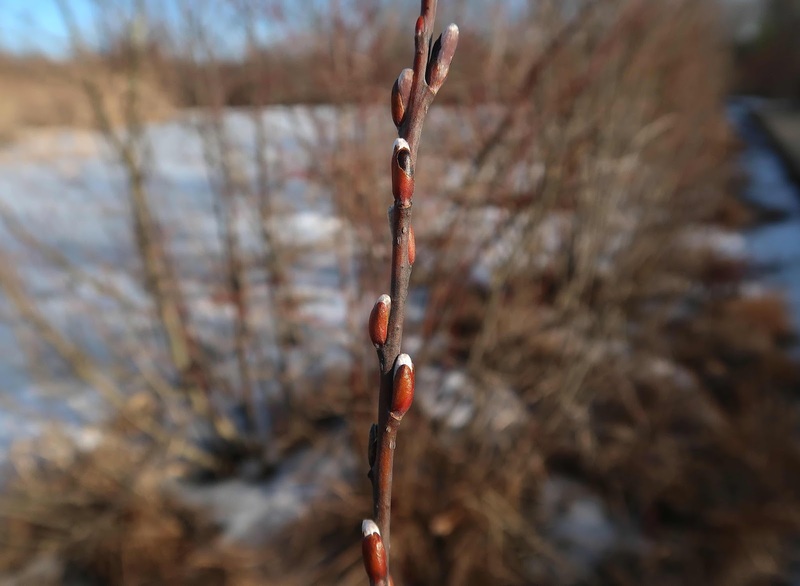 But these are the immature male flowers, formed last fall, that will open in spring to shed their ripened pollen on the April air. The persistent seedheads of Round-headed Bushclover (Lespedeza capitata) are easy to spot against the white snow, looking like clusters of baby hedgehogs atop their tall stalks. 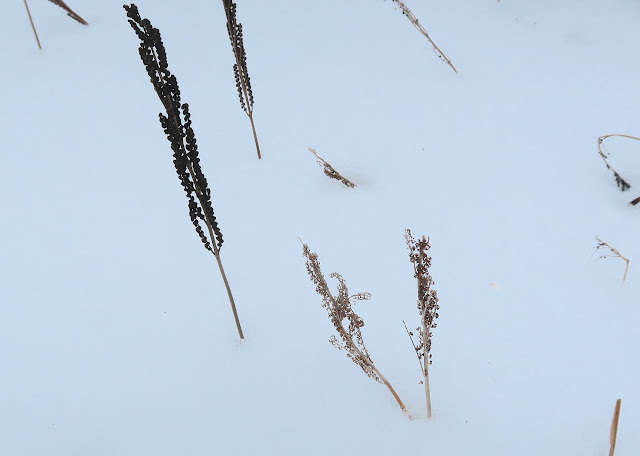 The flaring bracts of Evening Primrose (Oenothera biennis) were easy to spot protruding from the snow. These stalks will not yield new flowers come summer, for they have completed their reproductive role by shedding their seed. New plants will emerge from basal rosettes of leaves that are wintering under the snow. Along the powerline clearcut that runs across the top of Mud Pond, many Bear Oaks (Quercus ilicifolia) had been toppled by the power company last year, a completely useless operation in my opinion, since this shrubby species of oak never would grow tall enough to interfere with the overhead wires. 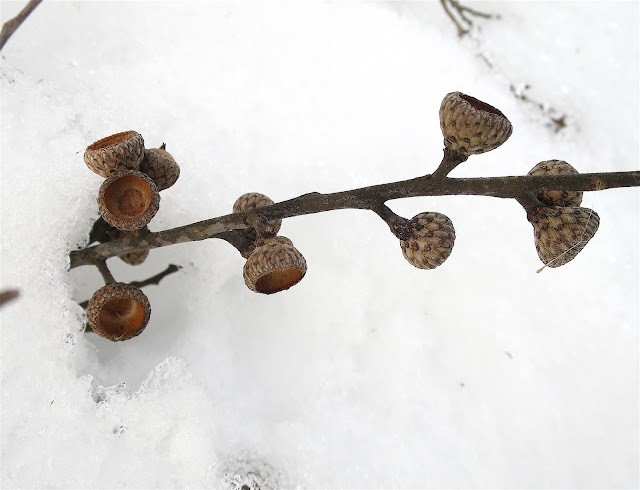 The felled branches shed their acorns long ago, but the acorn caps still cling to the twigs. I love how they resemble intricate Native American basketwork. 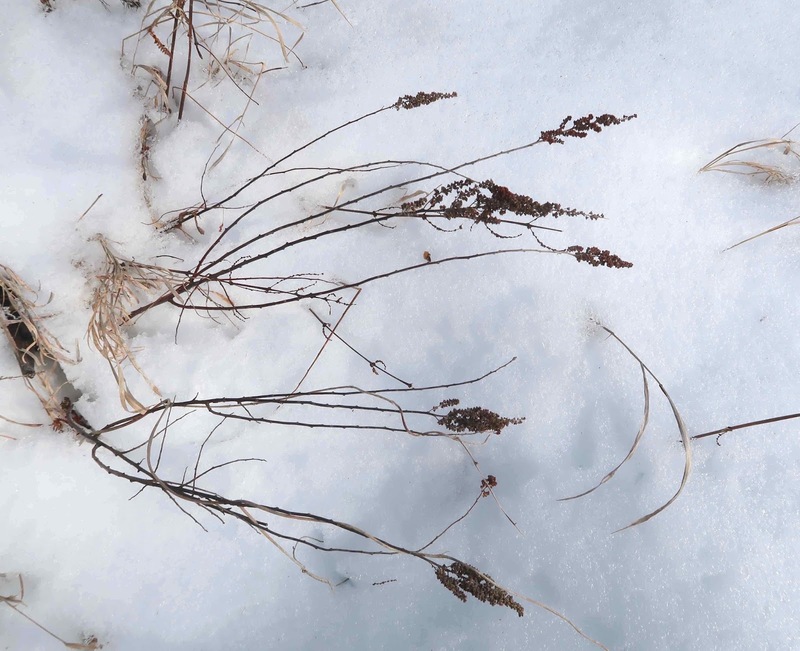 I love everything about Sweet Fern (Comptonia peregrina), and in every season. It's actually a woody shrub and not a fern, although its marvelously fragrant leaves do have a ferny look when green. 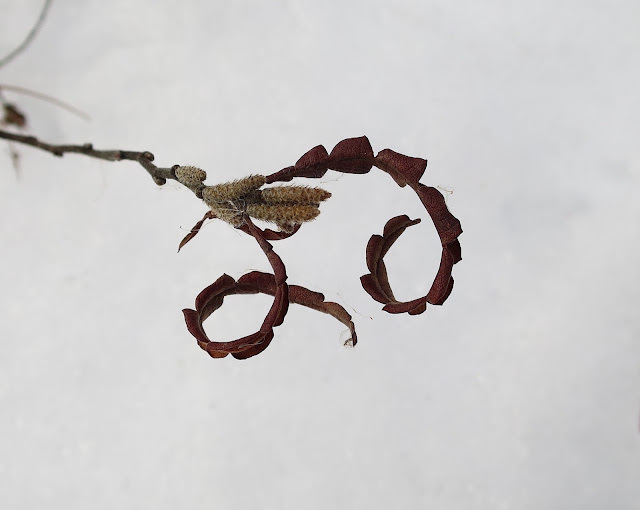 These leaves retain much of their fragrance even when the leaves have completely dried and become gracefully curled. 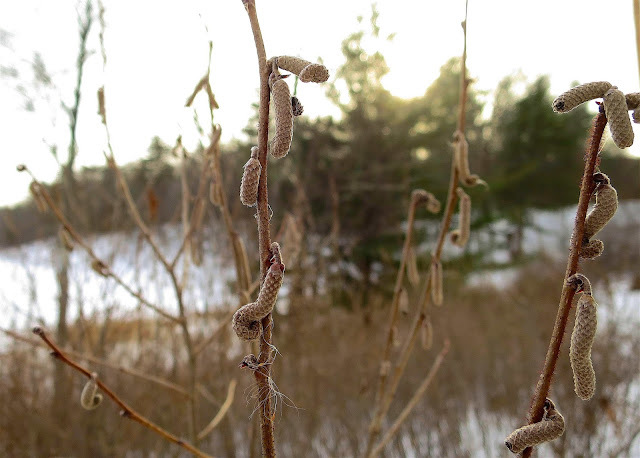 Those fuzzy nubbins are the male catkins, which will open to shed their pollen in the spring. Oh joy. It's raining today, making a mess of the beautiful snow that fell earlier this week. 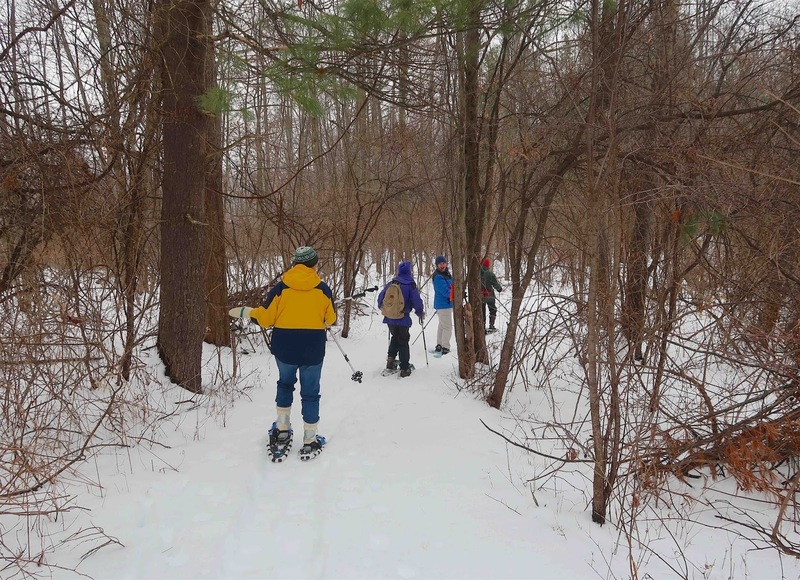 Now I'm extra glad I joined my friends in the Thursday Naturalists to snowshoe through the new fluffy stuff that filled the woods at the Anchor Diamond Park south of Ballston Spa two days ago. This nearly 250-acre, heavily wooded park, the site of an 18th-century mansion now fallen to ruins, has miles of hiking trails through mixed forest and wetlands. 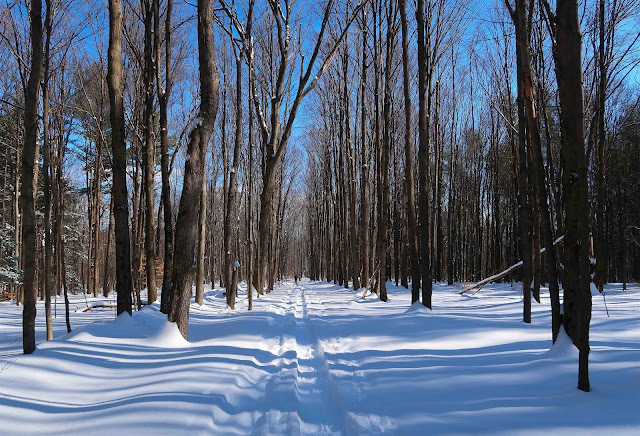 Only recently opened to the public for "passive recreation," the park has become a popular destination for snow-shoers and cross-country skiers, who already had nicely packed the trails to make it easier for us to make our way. 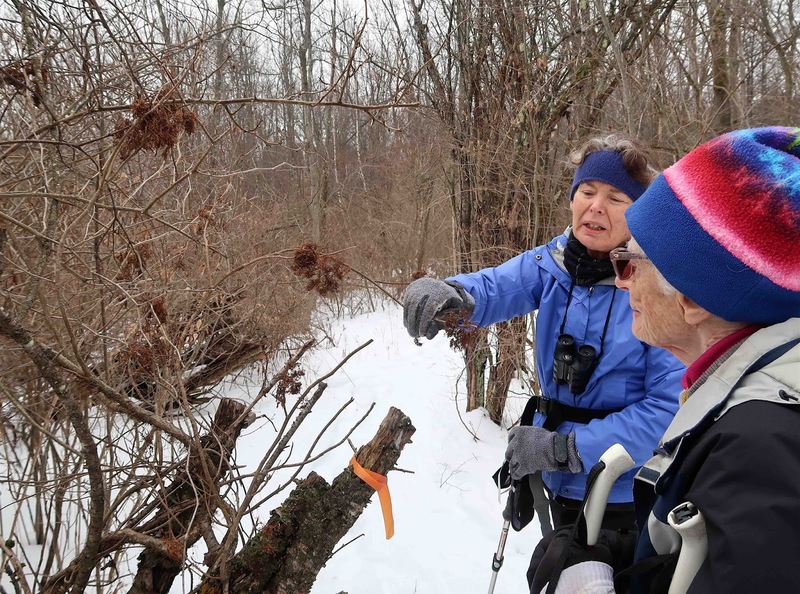 I must say that these cheerful and knowledgeable women who joined us today, some past 90 years of age, certainly do inspire me to keep getting out there, even on days when I might be more inclined to stay indoors. But this day was one that truly invited me to get outdoors, so fresh and clean-scented was the air, so bright and blue was the sky, so delightful was the company, and so diamond-sparkly was the pristine snow that carpeted the forest floor. That lovely carpet of snow was criss-crossed this morning by the tracks of many mice, the marks of their tiny hopping feet connected by the impression of their tails as they scurried here and there. Their trails always remind me of trapunto stitching on a quilt. 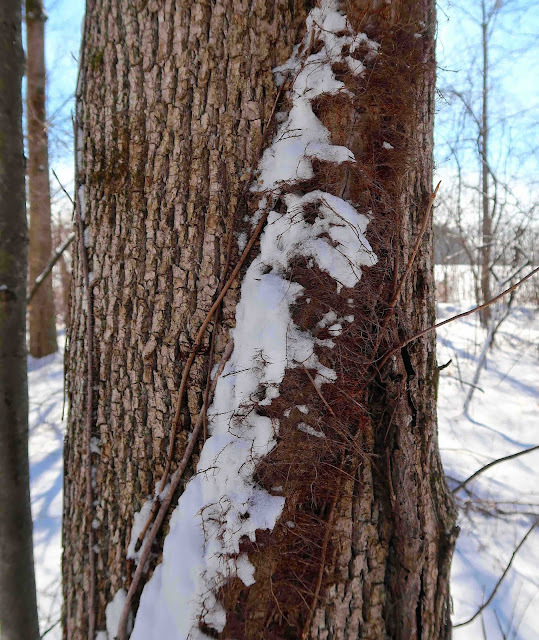 Without their leaves, some trees are difficult to identify in winter, but that's not the case for Black Cherry, with its distinctive shaggy black bark that has been described as "burnt potato chips." I have also heard the Black Cherry referred to as the "cornflake tree." 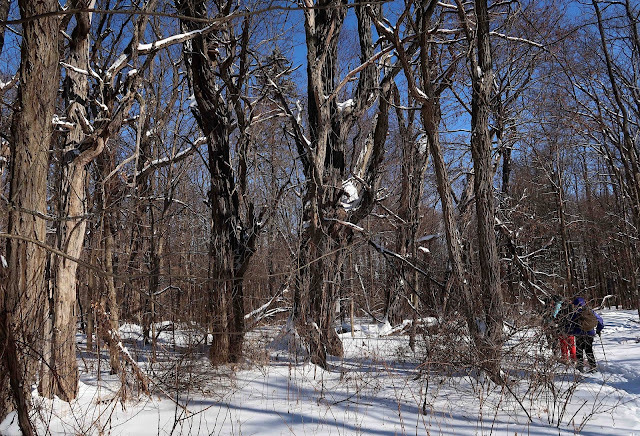 There are many mature cherry trees in the woods at Anchor Diamond Park, some of considerable size. 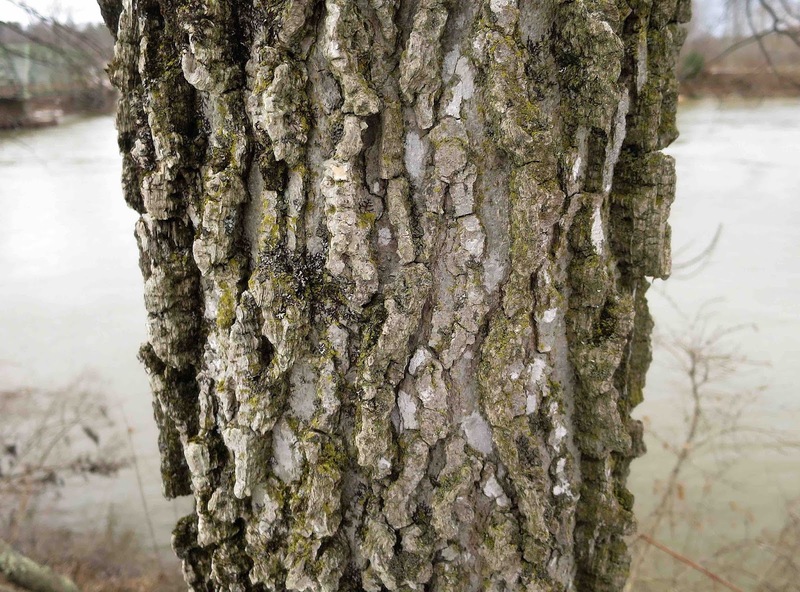 One tree with thick, corky bark had us puzzled for a while, but then I broke off the chunk of that bark and noted the alternating layers of dark and light, a distinctive feature of American Elm. This reminds me of those crispy wafer cookies filled with chocolate cream. 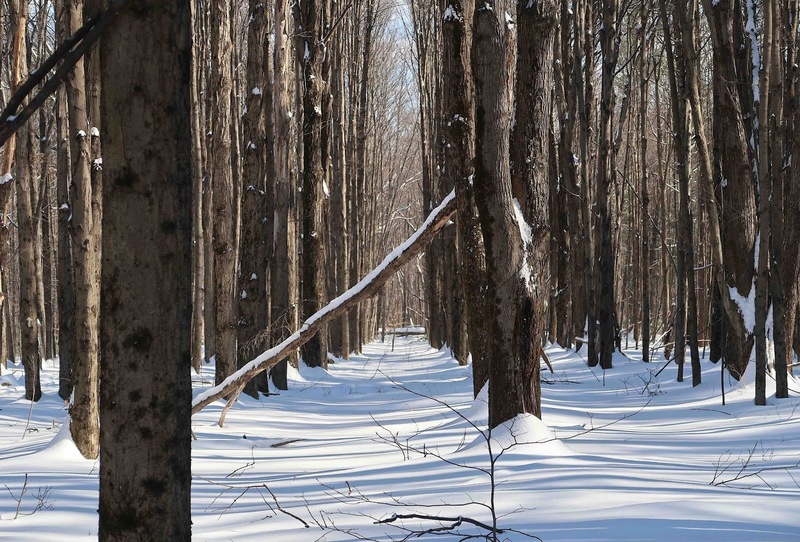 When we arrived at this section of the woods, where Sugar Maple trees were aligned in straight rows, we surmised we had come upon a sugar bush, where these maples had been planted with the intention of tapping them for their sweet sap. These monumentally large, ancient Black Locust trees appeared to also have been planted along the old roadway, possibly to serve as a source of fence posts. 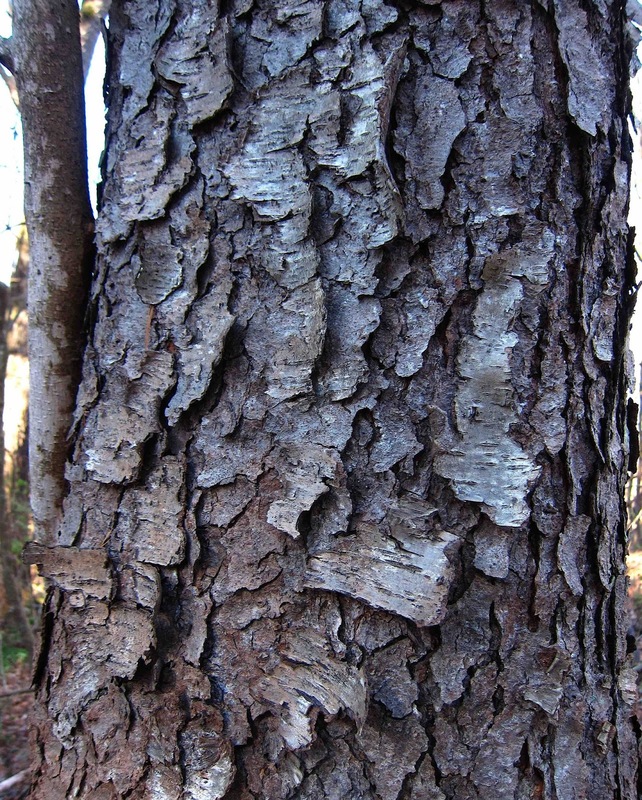 The wood of Black Locust is known to be especially resistant to rot. But as this photo reveals, this species does eventually succumb to the ravages of age. 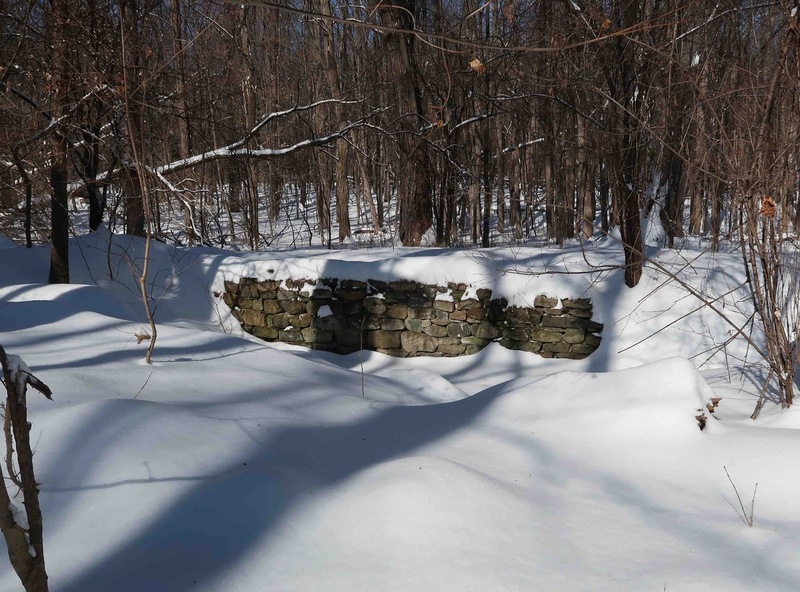 The palatial mansion that once stood at the center of this forested site has long ago fallen to ruins, but its location can still be detected by the presence of old stone walls. Mesh fencing surrounds much of the site where the mansion, called Hawkwood, once stood, both to prevent injury to hikers who might fall into old pits, as well as to discourage intrusion into a site considered archaeologically significant. Here we are, heading home. We could hear the noon whistles from nearby fire stations, and also the grumbles from stomachs hungering for lunch. There's nothing quite like a walk through a snowy woods on a clear cold day to whip up an appetite. And what a lovely way to earn our calories!